And on the seventh day, I was riding a shiny new black BMW and another bike up to Calistoga and back, which is the next best thing to resting, and so here is this Sabbath’s apropos CoMO without further ado. Everyone behave yourselves, alright? Be nice to others and get some walking in. Two ways to get outta town. 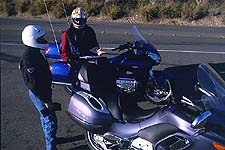 Two ways to get outta town.Torrance, California, January 2, 2001 — During the first five years of MO’s nefarious existence, Honda’s Gold Wing reigned supreme as king of the all-out touring hill. Indeed, during that time we felt the ‘Wing was the epitome of what a long-distance tourer should be. 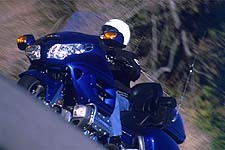 Enter 1999, however, and the tides changed with BMW’s stellar K1200 LT, a model that, in last year’s Long Legs shootout, dethroned the ‘Wing for the first time. Considering that the Gold Wing had been one of Honda’s top-selling bikes with an impressive history of reliability, we didn’t think Big Red would take the number two spot lying down. Since its introduction in 1975 as an unfaired, yet still comfortable, mileage-eater, the ‘Wing received a number of revisions to keep it ahead of its competitors. Recently, it was on the receiving end of a make over so thorough and unlike anything a tourer has undergone before or since: Engineers from Honda’s race team was called in to make this new bike, the GL1800, even more capable of state-line dances while allowing it to retain its composure in the twisties like last year’s champ, the BMW K1200LT. The K1200LT was designed to target the same niche that the GL1500 Gold Wing had grown so comfortable ruling — and then take things one step farther. The basic platform had, on paper, all the same basic accouterments that enabled the Honda to generate such a loyal following in previous years. But it went about getting to the same end via different means in a typically well-put-together-package. After stepping off our BMW K1200LT and onto a plane for Ohio and the ‘Wing’s press intro, we had all the tools in place for a bit of a mental comparo before we could actually get both bikes side-by-side. All we needed was a few miles in the Ohio hills to know that, when we got back to California, we had an escalated battle on our hands. It was constant banter among staffers as to which bike they preferred. As each bike’s strengths and weaknesses varied, so did each rider’s wants and needs. Which brings us to the first point: Why would a bike like this come stock without heated grips? Sure, they’re available as an “option” but when you’re already paying 18-large for a decently equipped model, what’s an extra hundred dollars or so among friends? The BMW edges into an early lead here by virtue of its heated grips that come as standard equipment. Okay, we’ll back off for a moment. The Gold Wing and BMW are both capable of being optioned to the point that you might consider never driving a car again. They are fast and comfortable and seem to combine all the best attributes of both car and motorcycle into a package only one-third the size of your typical cage. The BMW is essentially the same machine that we tested last year. That’s not a bad thing, however, having de-throned the Honda rather summarily. Thanks to more ground clearance and less weight, the BMW is still the champ in the twisties. As we found out at the Honda’s press intro, the newest ‘Wing takes up where the old one left off and goes more than a few steps forward. Power is increased thanks to a sizeable bump in displacement, handling was improved thanks to re-worked suspension and a monstrous twin-spar aluminum frame. The bike’s looks also received a long-overdue redesign. Welcome into the new millennium, guys. 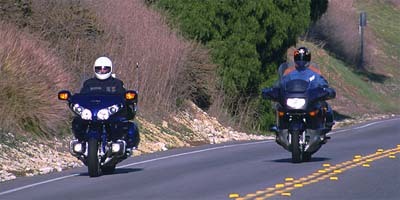 Side by side, the KLT looks a bit rounded like a whale whereas the Honda looks, well — it still looks like a Gold Wing. It’s more rounded than its predecessor, though, with a slopey little nose that looks like some soap opera starlet and a back end that looks one part Accord, one part Sophia Loren. Just think of Sophia’s nicely-rounded derier, but with blinking lights and a distributor’s license plate. The BMW’s contours integrate the bags a bit nicer, tucking them in and molding them to the bodywork tighter than the Honda. Storage space in both bikes is ample, with the nod going to the Gold Wingfor a bit more storage space. As far as ingress and egress of gear goes, the Honda still has the superior system. Stand at the rear of the bike and one hand can easily open any of the three large storage compartments with a flip of the appropriate lever. A bit spaceship-like in its appearance, the BMW carries its top box rather high, but tucks in the side bags well. The Wing also has a cool keyless-entry for the trunk, but getting the side bags to close solidly can be a pain. They might stay closed, but the electronic display in front of you insists that they are not. Not a big thing, but annoying, nonetheless. Conversely, when you close the BMW’s bags, you know they are closed solidly. In fact, the whole bag system on the BMW has a much more solid feel to it. 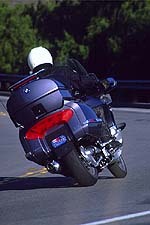 One point of contention with the BMW’s bags, however, is that the six-disk changer takes up a decent chunk of room in the right saddlebag that could otherwise be used to hold clothes. Here, the edge remains Honda’s. Which brings us to more ease-of-use issues. Want to raise the windscreen? The KLT has a little two-pot switch on the left control panel. Push up and the windshield raises and gets a steeper angle. On the Honda you need to pull over or switch on the cruise control while you take your hands from the bars and flip one lever on either side of the fairing before grabbing the fairing itself and yanking it up. Lowering the BMW’s fairing requires nothing more than a mere flick of the button in the down direction. For the Honda? Flip the same levers and raise the windscreen all the way to the top. Now you can push it back down. Sigh. Give the edge to the krafty Krauts, here. 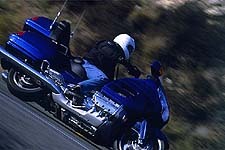 The Gold Wing gained quite a bit in terms of cornering prowess, but its true strength lies in its motor. Conversely, pre-load adjustment on the Honda can be done semi-on-the-fly. There’s a nifty little switch on the panel by your left knee that will increase or decrease the pre-load over the course of fourteen positions. There’s also a two-position memory for pre-load that can easily be set for either single or two-up or single-but-loaded-down-Beverly-hillbillies-style. This is in stark contrast to the old world, under-the-seat knob of the BMW. Both are effective, one is just easier to get to at a stop. On the road, it’s another tale of two means to the same end. For instance, the Honda has far superior low-speed manners while the BMW is the high-speed hauler that the Honda cannot be. Conversely, the Honda makes parking-lot maneuvers a far less daunting task than the BMW makes them feel. The only edge here that the German bike can claim is that a rider can drag the rear brake in tight U-turns independent of the front binder which is linked to the rear as on the Honda. The motors on the two bikes are incredibly different, both in their fundamental design and in their power output and delivery. The Honda’s flat-six absolutely tromps BMW’s inline-four. 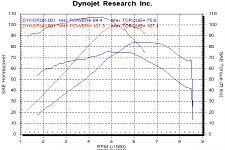 It even makes more torque at its lowest point than the KLT’s motor makes at its highest point. You might want to read that line again as it’s mighty impressive. Likewise, horsepower is also more abundant in the Wing and flows from the right hand like whiskey from an Irish barkeep. Edge to the Honda here, then. A nice change from last year, no doubt. The new Wing features both easily operated techno-gizmos as well as a rudimentary pull-to-raise, push-to-lower windscreen. On the open road, it could generate around 300 miles per tank which is a bit past what the Wing could muster even from a fuel capacity that’s almost one-half gallon larger (including reserve) than that of the KLT. Throughout either bike’s range, however, we’d have to give the ergonomic edge to the Wing, especially where two-up touring is de rigueur. Pilot accommodations are nice and roomy and the seat provides good back support. The passenger, meanwhile, might as well fall asleep. In fact, they did on numerous occasions because they were so comfortable and so coddled. It was just so car-like, really. Is this the view for you? 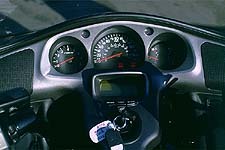 The Honda’s instrument cluster is a bit busy until you figure things out. It’s also a nice seat from which to watch the world wizz by. When the going gets twisty and it’s just the bike, rider and the road (as we think it should be), the BMW has its chance to shine. The KLT has more cornering clearance, better brakes (they are slowing less tonnage, of course) and feels more planted and easier to flick side-to-side. Coming out of the corners, though, the Honda will creep up on the BMW with its prodigious power. A BMW pilot had best learn to shift often to keep the mill boiling where it makes its power if he hopes to keep the Honda behind. The audio systems on the two bikes also differ, with the nod going to the Honda. Despite a control system that is a bit more cluttered, once you know your way around, things make sense and altering stations, CDs and volume is intuitive. Quality on the BMW is a bit better at low speeds, but the Honda’s system gets the nod as speeds rise and the BMW’s quality deteriorates comparatively. Again, though, the rear speakers on the Honda are a nice touch and should be standard equipment, as is the case with the BMW. as is, they’ll set you back a few more bills. On a long, straight stretch of road where mile-eating is not just a distraction but the whole point of the ride, the Wing is where you want to be. It eclipses the BMW once again as the state-line-connector of choice for the new millennium. It shouldn’t be any worry to BMW owners, though. They’ve got things pretty good with their K1200LT, anyway. Neither bike is bad in any respect, it’s just that the new Honda is more well-rounded and easier to use for most pilots in most situations. That counts for quite a lot, both around town where boatloads of torque help things along, and on the open highway where superior rider and passenger comfort take less of a toll on you. And that’s the whole point of it all, isn’t it? Sure, the ride is the destination, to some. But even those hard-core riders will admit that there’s something to arriving at a hotel for dinner a few state lines and time zones away feeling refreshed and awake, having just enjoyed the days ride instead of merely having put up with it. And for that, the wing is, once again, the thing. 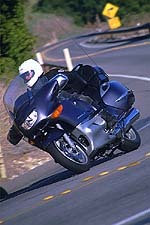 The post Church of MO: 2001 BMW K1200LT vs Honda Gold Wing appeared first on Motorcycle.com.